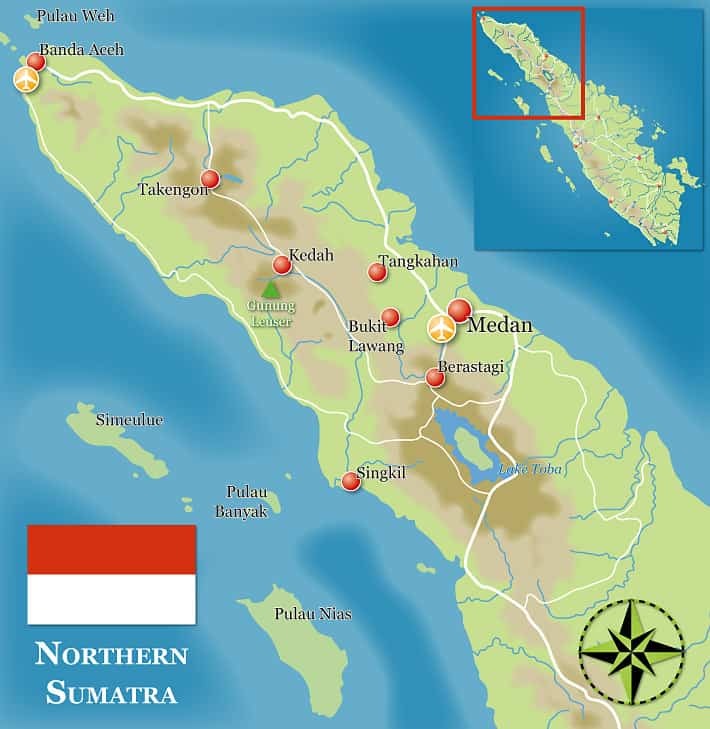 The best airports to fly in to the North of Sumatra (Kuala Namu Airport, Medan) are Kuala Lumpur, Penang, Bangkok, Jakarta or Singapore. We recommend AirAsia, Firefly and Jetstar flights, which operate from all these airports, they can easily be booked online by yourself and are pretty cheap! But also Malaysia Airlines, Garuda or Silkair are good options to fly in. 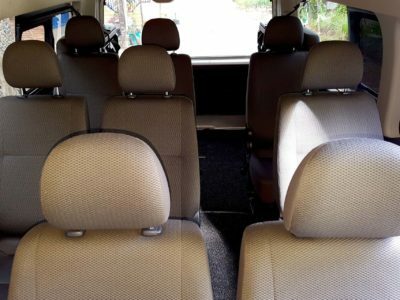 Make your Sumatra holiday easier and more comfortable with our choice of air-con shuttle services (air-con car or minibus, driver, petrol). All our transfers are operated by local companies, usually by “Sapril’s Transport Bukit Lawang”, but can also be organized by our partners at Lake Toba, Medan and Pulau Weh. EcoTravel-tours are group tours, so there will be other EcoTravel guests joining you if their arrival/departure is at the same time. Currently our maximum group size for transfers is up to 8 people but especially in low season you may sometimes be on your own. Please give us your pick up details no later than 3 days before arrival if you would like to use our shuttle service! Sumatra EcoTravel offers this unique combination of 1-day tour & overland transfer to Lake Toba! Along the way you stop at several spots in the Karo Highlands: the famous fruit market in Berastagi, a traditional Batak Karo village and the Sipiso-Piso waterfall. This service can only be offered exclusively for EcoTravel guests! Travellers on a smaller budget are welcome to make their way to Bukit Lawang by public transport. This can be a bit of an adventure, it’s cheaper, but it takes longer. Please make sure not to arrive later than 06:00 pm in Bukit Lawang! 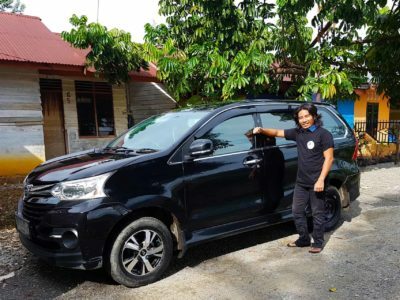 If you contact our office at least 1 hour before your arrival by phone under +62-822-76092633 we will send somebody to pick you up at the taxi stop or bus stop in Bukit Lawang central and guide you to your guesthouse. You are also welcome to make the way to our EcoTravel cottages by your own – just walk 15 minutes up the river, right side, in direction to the old orangutan feeding platform. From Kuala Namu Airport To Medan Center: If you wish to travel from Kuala Namu Airport to Medan first, DAMRI buses run about every fifteen minutes. They go to Plaza Medan Fair (blue colour) on Jalan Gatot Subroto, about 6 km short of the bus station for Bukit Lawang, and also to Amplas bus station (for Lake Toba). Fares are 15,000 IDR to Plaza Medan Fair and 10,000 IDR to Amplas. A comfortable train service (Railink) runs from the airport to Medan, which is faster than the bus, but runs only roughly every 30 minutes. The fare is at 100,000 IDR one way. From Medan center to Bukit Lawang: If you like to travel from your Medan hotel to Bukit Lawang: all buses leave from Pinang Baris bus station. To reach this area from Medan center, either take a taxi (around 30,000 IDR – 40,000 IDR – Bluebird and Express taxis), or a yellow local bus (around 5,000 IDR) labelled as going to Pinang Baris, ‘Kp. Lalang’ (Kampung Lalang) or ‘Binjai’. Last bus from Medan is around 5:00pm from Medan, and the journey time is 4 hours. 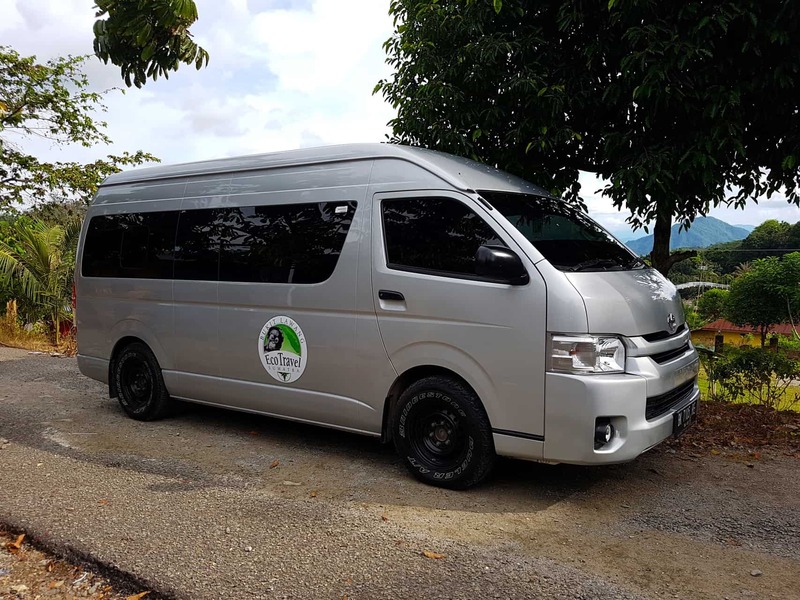 Tourist bus from Bukit Lawang to Medan & further destinations: Public transport to Medan, Berastagi or Lake Toba is available through a daily tourist bus service running from Bukit Lawang every morning at around 08:00 am. Our team will be happy to support you with ticket purchases if required: Medan: 150.000 IDR / pax, Berastagi: 170.000 IDR / pax & Lake Toba: 250.000 IDR / pax.